Designed as a stand-alone solution for infrequent users, a 1-Hour Quick Flush - Ultra Mask is the most reliable way to prepare for a urine drug screen. A fast cleansing liquid formula combined with concentrated creatine and vitamins makes Ultra Mask a no-nonsense solution for rapid detoxification. Effective in as little as 1 hour, Ultra Mask is fortified with a variety of nutrients to assist your body in flushing toxins on short notice: vitamins, herbal supplements and creatine. 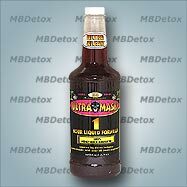 A trusted name in fast detox, Ultra Mask comes with a 500% manufacturers money-back guarantee. Abstain from any undesired substances for at least 2 days before submitting to a drug test. One hour before test time, drink the entire bottle of Ultra Mask. Fifteen minutes later refill the bottle with water and drink another 25 ounces of fluids. Urinate frequently several times before submitting your urine sample for testing. 1-Hour Quick Flush - Ultra Mask will stay in effect for 2-4 hours. Make sure to submit your sample within that period of time. For best results make sure you abstain from drug use for at least 2 days before testing. If at all possible abstain for longer. For light users 2 days of abstinence is enough to allow Ultra Mask to be effective. Heavy users will benefit and see improved test results if they can abstain for longer periods of time before testing. Also, for heavy users it is recommended to take Power Flush Capsules prior to using Ultra Mask. Remember, results are temporary lasting several hours with maximum potency 2 hours after use.